TERRORIST CELL DiCaprio comes close to phoning it in as a Middle East CIA operative in the latest from Ridley Scott. Ridley Scott and Russell Crowe have now collaborated on five films. The work they have done together has ranged from the timeless (Gladiator) to the tiresome (A Good Year). Their new espionage thriller, Body of Lies, ranks somewhere in between. It has its moments. The problem is that we’ve already seen so many of them in other movies. Notice that we’re in the second paragraph of the review and I haven’t even mentioned Leonardo DiCaprio yet. The once reliably inventive actor delivers a strictly workmanlike performance in the role of Roger Ferris, a CIA Middle East field operative. We are asked to believe that, because he speaks Arabic, has a scraggly beard, and dresses like the locals, he can pass for a native. For me, this was not the movie’s most convincing element. Crowe, who inexplicably packed on 50 pounds for the part, plays the agent’s Langley-based handler, Ed Hoffman. He has an equally inexplicable haircut and accent. He also has access to the world’s most sophisticated surveillance technology, and, as much as anything else, this is the film’s focus. It shows us that the war on terror is being waged not just with telescopic sky-track satellites and Predator drone-mounted cameras that can read the time on a jihadist’s watch and beam it back to war-room widescreens — but also with Blackberrys, laptops and simple cellphones. DiCaprio is monitoring the safe house of an Al Qaeda offshoot in the hope of capturing its leader, Al-Saleem (Alon Aboutboul), who is responsible for a series of suicide bombings all over Europe. On the other side of the world, Crowe stays in nearly constant contact with the agent by means of a hands-free cellphone he seems to have had surgically implanted in his ear. In a sort of running joke, Scott contrasts the perilous on-the-ground conditions in which Ferris lives with the cushy suburban remove from which Hoffman puts him through his paces. The latter issues life-and-death directives while performing domestic tasks such as driving his kids to school, helping his son in the bathroom and watching his daughter play soccer. A little of this goes a long way, and there is a lot of it. Scott is a director whose greatness is beyond debate, of course, but he is not at his best in bringing David Ignatius’ novel to the screen, and he makes a major miscalculation in his framing of the story. Very little of interest happens in the first two-thirds of the film. 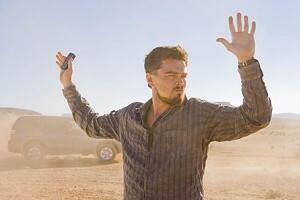 It takes too long for DiCaprio and Crowe to stumble on the scheme that should have been the entire picture’s premise: They decide to use the power of the Internet to create a fictional terror organization and fabricate a series of high-profile attacks on American interests, hoping Al-Saleem will be drawn out of hiding by a mix of curiosity and jealousy. This is an intriguing notion, and its execution is the most entertaining part of the picture. But the viewer’s fun is doomed to be short-lived. No sooner do our heroes concoct their plan than Scott jumps this original and suspenseful track to steer us back into familiar genre territory. If you’ve seen The Kingdom or any of the Bourne films, much of the globe-trotting action in Body of Lies will evoke a sense of déjà vu. In fact, the movie has whole scenes and speeches that seem to have been lifted directly from Syriana. Both films feature lots of shots of Langley suits monitoring Middle East developments on the ground by means of those powerful, omnipresent eyes in the sky. Both feature frenetic desert chases; both feature a sequence in which a major character is taken prisoner by terrorists and tortured; and, most notably, both feature a scene in which an American lectures a Middle Easterner on the industrialized world’s view of his homeland. Remember Matt Damon telling the prince, “We think 100 years ago you were living in tents in the desert chopping each others’ heads off, and that’s exactly where you’re going to be in another hundred”? Virtually the same sentiment is echoed in this film. That’s just too close for comfort. A been-there-done-that-ness pervades Scott’s latest, and the film’s central performances do little to enliven things. Both DiCaprio and Crowe glide through the movie’s political machinations more or less on autopilot, while the director gives the impression of grasping for a theme. Syriana was about oil. When you get right down to it, what is Body of Lies about? Technology? Terrorism? The film has nothing new to say about either. Nor does it shed new light on counterespionage techniques. Scott appears to have felt obliged to contribute to the post-9/11 cinematic canon, but this derivative, half-hearted offering is destined to stand as a footnote to his distinguished body of work.